Current schedule runs through the first weekend of September, 2018. All running tours begin and end in Kiener Plaza, at the Runner statue. You’ll love the newly redesigned park! A 3.5 mile route winds through the streets and parks of downtown St. Louis taking you past, under, over and through some of the most important historic points in St. Louis. Weekend tours now scheduled through the end of the summer 2018. Weekday tours are available from May through August. Includes guided running tour, group and individual pictures sent via e-mail, a post-run drink, and the official St. Louis Running Tour t-shirt (optional). There is no minimum number of people required for the downtown St. Louis route. Always Saturday & Sunday mornings 8 AM, but from May 2018 through August 2018 – along with Saturday & Sunday mornings, additional tours are scheduled on Wednesday and Friday to take advantage of available daylight late in the day. Street and garage parking are available around Kiener Plaza. Street parking meters cost 25¢ per 10 minutes. Metered street parking is free on Sundays only. The 3.5 mile route we take downtown stays mostly on the sidewalks and travels a generally flat course. On the occasion when we do go up or down hills, they are short, but noticeable. 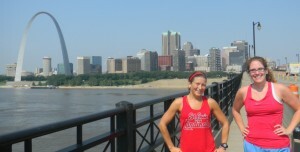 And those steps in front of the Gateway Arch will be an accomplishment to talk about back home. Don’t worry, we’re not talking about taking steps up the inside of the Arch. The St. Louis Running Tour takes the approach that the group stays together during the run so that all can hear the information and nobody gets left behind or too far ahead. With multiple stops along the way, comfortably completing the entire 3.5 mile route is very manageable even for beginning runners. But just remember, this IS a “running tour”.